What a powerful promise! Whatever we ask In His Name, we will receive! Peter, after his conversion, understood the magnitude of the birth, life, death and resurrection of Jesus. We cannot continue to live in sin and think just because we ask in the name of Jesus we will be granted our requests. It is the prayers of righteous men and women that avail with God. 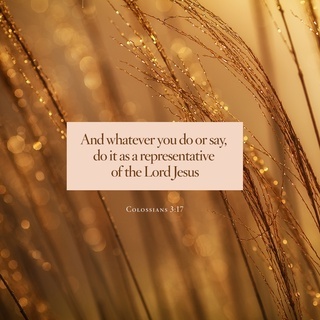 This means IF we are abiding in Christ we can ask and it shall be done. IF we are walking in obedience to God's Word, then we can ask in the name of Jesus. 2. Praying in the name of Jesus is also subject to God’s will. In the weakness of human flesh, Jesus did not want to suffer. He wanted the cup of suffering removed, but He submitted His will to God's will. In some matters clearly defined in Scripture, we know the will of God and exactly how to pray. In other matters we can express our will, as did Jesus, then submit our will to His will; still, all in the name of Jesus. Requests made in the name of Jesus are subject to the sovereign will of God. We ask according to human reasoning and do not always discern God's higher purposes. Some disagree with this Biblical teaching; oftentimes confusing the gift of tongues found in I Corinthians 12:10 with the receipt of the holy spirit as evidenced with speaking in tongues (Acts 10:46-48; just one excellent reference). They will say you can ask ANYTHING in the name of Jesus and it will be done. He may answer your requests, but it may not be in your best interests. He did this for the nation of Israel. We must also realize that when we ask for something on behalf of another person that their will enters into the situation. Nobody, through prayer in the name of Jesus, can push something on someone else which that person does not want. Another person's will and unbelief can affect your prayer for them. God does not take away the free will of man. 3. There can be no disbelief. In John 17, Jesus prays a great prayer concerning the men God gave Him as disciples. All these men received the same training. They saw the same miracles. They received the same Word of God. But yet one of them was lost. Judas still had a will of his own, and despite all he had heard and seen, rejected God's Word in unbelief. Jesus spoke of the power of agreeing with others in prayer in His name. 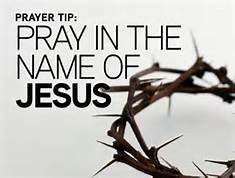 We should also give thanks to the name of Jesus.